It was a relatively simple play, but it took world-class skill to execute. The Washington Capitals had trailed the Florida Panthers by two goals late in the third period before rallying to force overtime in a game on Feb. 12. Just seconds into the extra session, Troy Brouwer collected the puck and skated to the right in his own zone. He left the puck for Nicklas Backstrom as he skated in front of the Swedish center at the top of the right faceoff circle. Backstrom slowly skated the puck to the left and towards the blue line, while Brouwer charged up the right side of the ice, basically like a running back on a wheel route. Backstrom held the puck for a full two seconds, and then deftly lifted a beautiful pass through all four Florida defenders in the neutral zone. It landed perfectly on Brouwer's stick with him breaking in alone on the goaltender for the winning goal. "I knew I was going to pass it to him when he dropped it to me. That's when I knew," Backstrom told NHL.com "He was coming with good speed, and I was just trying to wait him out until he got in a good position. Yeah, it was a nice play." At that point, the Capitals were still trying to dig out from an awful 2-8-1 start. It led to the team's second victory in its first three-game winning streak of the season. There have been two more such streaks, but Washington will try to win four straight for the first time this season -- and possibly pull even on points with eighth place in the Eastern Conference -- on Tuesday night against the New York Islanders at Verizon Center. It has been a trying 15 months for Backstrom. He's dealt with the first major injury of his career, and his typically elite offensive production has not been what it once was -- though the past few games have offered hope. While he hasn't dealt with the same volume of criticism as his buddy Alex Ovechkin, Backstrom's frustration has been palpable. "It is tough," Backstrom said. "Obviously you want to help the team as much as you can and be as good as can, especially when you get a lot of ice time. They put you on there in big situations and you want to produce. Sometimes you just have to get one of those fluky goals like I did [Sunday]. That's the way it works in hockey. Sometimes you struggle, but you just have to keep working." There was a point during Backstrom's rookie season when coach Bruce Boudreau, who took over in November, put him on the team's top line with Ovechkin and they've been paired together for most of the past four seasons with only brief times apart. They began this season together, but new coach Adam Oates wanted Ovechkin to play on the right side, and when that didn't work after a few games, the team's top two forwards were split up -- and stayed apart longer than they have at any point since the first couple months of Backstrom's career. "Whatever [Oates] wants to do, I mean [Ribeiro] played with him and played good with him," Backstrom said. "I played with Troy and [Eric Fehr] most of the time. I don't really think too much about who I'm playing with when I'm on the ice. I'm just trying to do my job out there. Obviously it is nice to be back with Alex. It is fun to play with him." Backstrom and Ovechkin did play together a lot -- during the lockout. When Ovechkin went home to Russia to play for his childhood club, Moscow Dynamo, Backstrom went with him when the Elitserien in Sweden didn't allow its teams to sign NHL players. It wasn't Backstrom's first time in Russia -- he played there for Tre Kronor at the 2007 World Championship -- but it was a new experience for him and a chance to play more games after missing nearly half of the 2011-12 season with a concussion. "We had a trip to Khabarovsk that was eight hours from Moscow by plane, and that was the day before Christmas. 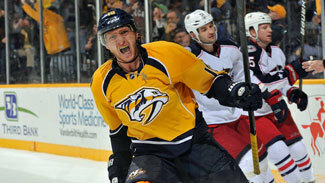 But I still made it home for Christmas," Backstrom said. "It was a little different. It is obviously a different culture, but it was fun. I was there two and a half months. It was a good experience. I played on a good team and we won a lot. It was fun, but obviously I was happy to come back. Here is the best league in the world." Backstrom, Brouwer and Fehr have been Washington's best three forwards at driving possession when the game is played at even strength, but it didn't translate into points for Backstrom the way it could. When Washington reached the 25-game mark of what was becoming a bleak campaign, Backstrom had three goals and 21 points. While the points didn't match his career standard, three goals on 42 shots was far off Backstrom's typical shooting percentage -- and something that could be rationalized as bad luck. "I've been trying not to think about it, because when I do think about it, it almost makes me go crazy," Backstrom said. "It is just stuck in your head, so I try not to think about it. Maybe I need to shoot a little bit more, but I'm happy with the way we're playing right now. If we keep playing like this, we're going to get chances. I think we're playing better as a team. We're moving the puck better, and if we keep doing that we're all going to get more chances." After a three-game losing streak, Oates decided to reunite Backstrom and Ovechkin. The team has won five of seven since, and both players have prospered. Ovechkin was named the NHL's first star of the past week, and has 11 points in the past seven games. While Ovechkin and Ribeiro may have had good chemistry, Backstrom's possession numbers are a good indicator that he can help the Capitals' captain find more chances at even strength. To that point, Ovechkin has three even-strength goals in the past five games after potting that many in the first 27 contests. Backstrom has a pair of goals and eight points -- not a huge bump, but more in line what expectations are for the 25-year-old. He's only had 10 shots on net in the past seven games, but, one "shot" might have been the start of his luck evening out. He was credited with a goal Sunday against the New York Rangers that deflected off his body and into the net. "Quite honestly, I never worried about it," said Oates, who was also a pass-first center in his playing days. "I always thought of myself as a passer. Basically, it is the same kind of clichés. If you're playing good hockey, it will go your way. [Backstrom] is playing good hockey. "The power play is a little different because we have Mike there as well. They are really feeding off each other a little differently than Nick has in the past, probably, so he's not getting as many shots but our power play is better. Maybe he has sacrificed a few goals or maybe Mike scored those goals that Nick would have gotten, so maybe he'd have seven or eight right now. They are all just little different adjustments, but I think he's playing really good hockey for us right now." The next couple of weeks will be critical to Washington's still-tenuous postseason hopes. If the Capitals continue this current run of form, they could make an improbable charge back to the Stanley Cup Playoffs for the sixth straight year -- not unlike the one they made in Backstrom's rookie campaign that started this era of success in this nation's capital. "It is a lot better. There's a lot more smiling in here," Backstrom said. "You got to fight through it, especially the tough times. We had a really bad start. That's what makes us work so hard right to now to win every game. That's going to be even more important the next couple days. "We just have to stick with it. We have to keep playing the way we are right now. The one thing we've talking about so much is playing the full 60 minutes. We can't have any letdowns in the middle of games now. We have to be focused, especially now."